A native of Battambang, Reaksmey Yean is a self-proclaimed art advocate, an early-career art curator and researcher, and an Alphawood scholar and a graduate of Postgraduate Diploma in Asian Art (Indian, Chinese and Southeast Asian Art), School of Oriental and African Study (SOAS), University of London. He is presently undertaking a Southeast Asian and Thai Studies with Institute of Southeast Asian Affairs (ISEAA) at Chiang Mai University (CMU), Thailand. Yean is Java Creative Café’s curator for creative program. Prior to joining the gallery team, he has served several posts at Phare Ponleu Selpak (PPS), a multicultural and multi-disciplinary arts center, and the only contemporary art school in Cambodia, including the last one as an Assistant to Performing Art department. He is also a graduate of Phare Ponleu Selpak, and the founding father of a defunct collective named Trotchaek Pneik, a cultural and artistic collective based in Battambang. Currently, he serves also as a member of Board of Directors for Music Arts School, Phnom Penh. Yean is interested in the multi-cultural and multi-disciplinary practices (Film, Visual and Performing Arts). As an Art Advocate, Yean is interested in the promotion of art and culture and their histories within the contemporary Cambodia, practicing as a curator and art critic. As a scholar, Yean is concerned with art history (both ancient and contemporary), theory, and philosophy. 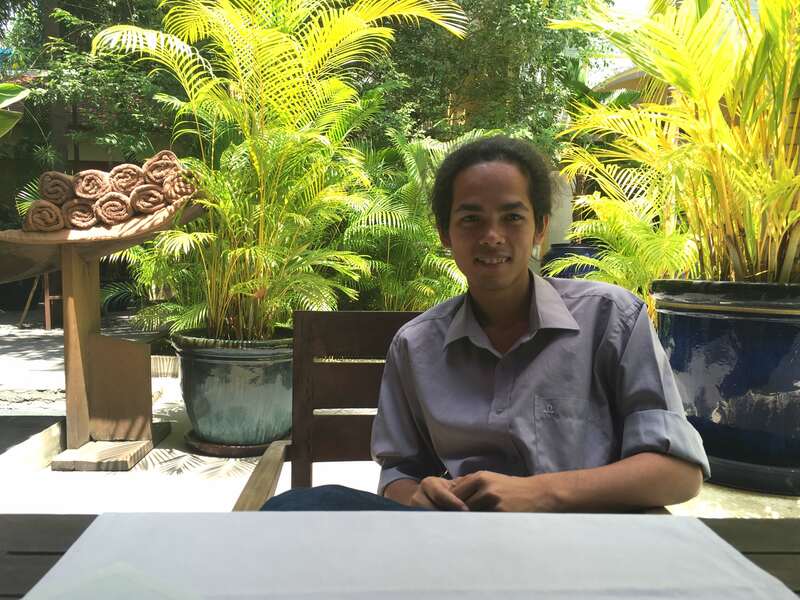 Apart from his interest in artistic and cultural activities, he is intrigued by linguistic studies, especially the Khmer language. He works as a translator and linguistic consultant for Khmer text and writing. Annie: Where did you study and what was your experience of art in your institution? Reaksmey: I was educated at Phare Ponleu Selpak, mainly in music, but I was also participating in visual art and theatre as well. I think there was no such thing in Phare Ponleu Selpak called contemporary art education. I think contemporary art is a matter of personal investigation and exploration of every Phare graduate from Phare Ponleu Selpak, exploring that on their own personal basis. Even now there’s no such thing called contemporary art education in Phare, the training was just to give techniques, and to allow the students to experience different types of art and different medium of art, rather than give them a critical approach or visual approach. Annie: How did you come to do your performance work? Reaksmey: The performance took place at the Angkor Art Explore Festival in 2011. I was really frustrated after I quit my job at Phare in the communications department, and I thought, I want to do something. I’m not very good at the drawing or painting, so I thought to myself, should I use my body to do something, with the experience. It’s also because of the conversation I had with Lydia Parusol [German curator working in Phnom Penh during the period] when I met her in 2010. She said, there’s a new medium that you should try to explore, ‘performance art.’ You know how to play music, you know how to perform, you have a lot of experience in the past, you should combine together and create a performance piece. It was the introduction from Lydia which prompted me to start a performance at the Angkor Art Explore Festival. Annie: Could you please tell us more about the Angkor Art Explore Festival? Reaskmey: The Angkor Art Explore Festival was a festival that was created to bring the artists in Battambang, Phnom Penh and Siem Reap together on a bike tour. So basically everybody came together to Battambang as a starting point on a bicycle journey to Siem Reap, and during the journey to Siem Reap we would stop at different places to bring art to the communities. There were performances, drawing, or games playing with the school students or with the market stores, things like these along the way. Annie: So in a sense, when Lydia suggested this medium and described it in that way, how did you see this form of performance? Reaksmey: When I heard of the term, I think it’s also because of my capacity for language, that when Lydia mentioned it to me she said performance art, and I knew immediately this was a different thing. I didn’t really associate that with performing arts or any other medium, but I questioned what is the difference, because it’s also performance. I did research to see, to understand the term, because it’s also difficult to translate into Khmer language. It led me to know of Marina Abramovic. So basically for me every time I hear about performance art, Marina is always in my thoughts. Annie: What is it that appeals to you about Marina Abramovic’s work? Reaskmey: I think the content of the work itself and also her enthusiasm. I remember when I first learnt about her work in the 60s or something, when she invited everybody to use some of the materials she laid on the table to pierce her skin with, some of them are pleasant things and some are unpleasant. I like this particular work because it had conceptualisation, it is conceptual art as well. And at the same time it’s participatory art, where audience can join her to make the piece together. This is one thing I like about performance art. And at the same time it’s not a space-based performance, you can perform anywhere, not necessarily to a big audience, but as long as the audience themselves engage into the work creating the work, then that’s a piece. So that’s what I like about her work. She likes to engage with the audience a lot, especially to let the audience to come into what I call the ‘territory of the work’, to create the art with her. Annie: You also mentioned liking Svay Sareth’s work? Reaksmey: I like his performance called Mon Boulet, it’s a French word also means to keep yourself in prison. I really like this piece because of the interaction with the audience as well, again it’s part of participatory art, where he invited the audience along the street to join in his Mon Boulet. In the performance he plays the cymbal, and ‘boulet’ is a big round ball, so he plays the ball with the audience. The audience participates with the ball by riding, so I like this piece a lot because not only was it a performance by one artist, but the performance reaches a very large audience. It’s not a site-specific performance, but the performance moves from place to place. He performed from Siem Reap, Phnom Penh and during this course, he met a lot of people, different audience, and the environment of the performance and the experience of the performance keeps shifting from place to place. Annie: Can you tell me about the performance you made at Angkor Art Explore? Reaksmey: The performance title is “Colour Projection” – which was a combination between music, dance and performance art. Back then I was frustrated with the idea that when I left Phare in the first place, a lot of people talked about me. They said that he’s a student there, why had he left Phare without thinking about us, many bad things, especially from the administration; not everybody, but a few of the administration staff there. So I felt I needed to do something to show people that talking behind somebody’s back is not a good idea. I told my colleague I will do a performance piece in front of the Raffles Hotel in Siem Reap. I bought this bucket of tomatoes, many of them, and I ask Mao Soviet, another artist, to help me. I put colour paint into plastic bags, and before the performance I asked Soviet to help me hand it to everybody. I did the dance, an impromptu dance with music – I forgot the name of the music. Then after the dance, I asked everybody, instead of applauding, to throw them to me. So everybody threw the tomatoes and the colour bags, and Bo Rithy, another artist, even used the tomato to hit my head. So that was the performance, basically to ask everybody to throw the anger, trying to transform the emotions from happiness into anger, to hit somebody whether you like the piece or not. Annie: And can you say a little more about the choice of using tomatoes and the colour bags? Reaksmey: Because with a tomato, you can break it, and sometimes it breaks and sometimes it doesn’t. I wore white during the performance, so basically it’s like no colour, so sometimes when a person throws a tomato, it might break or it might not. If it breaks, you can see the seeds, or the yellow, or sometimes the red of the tomato pouring on the body. The idea was to use something that is easy to break, and colour, I used different colours. Because every time you hit on the person with the bags, you’d see the colour change, it depends on how it mixed. So the white is also where the colour is mixing, when they throw the colours to me, when another one throws yellow or red, when the two combine together, it produces a new colour. Annie: You said in a way you’re transforming happiness into anger, but do you think it was just anger, or where there other emotions involved? And with the colour, what was the intention with putting colour together with anger, or does it change something else as well? Reaksmey: Well, in the first instance, I thought it was to transform it into anger, but nobody was angry at all. It was very happy, they thought it was an opportunity for them to throw things at me, so everybody just kept going. Even when the tomato had already dropped on the floor, everybody just grabbed it back and threw at me. It wasn’t really the idea that I had, but I like the idea of the participatory. I was very happy that they actually participated in it, even though they didn’t know what was happening with the tomato, but they still came and did that. Annie: When you were developing this idea, you mentioned Marina just now, because it’s the same dynamic of the artist, and then inviting people to participate and to interact in some way. When you were thinking of this, obviously you’ve talked about the tomato and the colour, but wearing white, was it meant to be neutral or did it have any other references? Reaksmey: White for me in that specific performance was about truthfulness, and also, I don’t know if it was neutrality, I wasn’t really thinking about that, I was also thinking this is a newborn person. This is fact, and you sometimes can manipulate fact into something else. It’s the environment itself that produced that fact, that newborn baby into something. The idea is also to show people that it’s our environment that produces a person, not the other way around. It was in the park in front of Raffles Hotel in Siem Reap. The space wasn’t really important, the important part was that I wanted to have at least people attending the show. But because the event happened in the garden, and because many different things were happening, so that’s the reason why it attracted a lot of audience to that. It wasn’t my idea to choose the space, it was rather the idea of the organisers, who would like me to be around that place. It’s very interesting choosing that space because during my performance I had these four poles with white cloth. They were not really flags but they were sort of like flags, you understand what I mean, the pole with the white cloth like a flag, on four corners. My idea was to burn everything, before I started the show I have to burn them. But one day before the show, there was a fire next to that space that burned down a lot of houses, and the governor or the authority of that space did not allow me to burn that, so basically they asked me to only burn one instead of four. I did burn one. So basically the four poles was also the perimeter, a border as well. I tried to burn it down, to burn the border, to get out of the border. But apparently we can’t do that, I could only burn one. So basically I was dancing on the border, trying to go out sometimes but you can’t, because it’s still a border, you have to come back into that border. So you really have to remove that barricade out of yourself to really, blend into something. Annie: What was the audience response during and after the performance? Reaksmey: Darren Swallow, a gallery owner in Battambang, came to me. He said it was interesting, and he himself could understand the message because he used to be in theatre. He just said it was nice, it was a short work, then we talked and I said I don’t want to hear nice, can you just tell me what do you get from the performance, and he explained, and I was like, oh at least somebody got what I meant. I think I liked the experience of making the performance a lot, but also as a personal performance, it’s like a reconciliation for myself, it’s also kind of like, removing the trauma. I was happy, I said like, okay fine, nothing else will happen, because you put everything into that, and when it’s done it’s done. Annie: Would you make another performance work? Reaksmey: It’s always in my head. I rarely talk about that to other people, but I have two projects in my head that I’m basically working on. It won’t happen very soon, but yeah, I’m basically drafting my own constitution, creating the constitution for myself, and then the performance will be based on that constitution. Something like that. I like the participatory, I like to engage with a larger audience. The project that inspired me very much was the project in the UK, it was called something like No Border No Land, I forgot what it was exactly, but it was about this mass, not very big. It’s like an island, with a boat, and they transport it everywhere in the sea to give them spaces, international space or entering into the UK. They also have one embassy with them, everywhere they stop there would be one embassy. And you have to register to be a citizen of that land. When the project finished, they will piece those islands and send it to those registered. So now they have their own land, or something like that. I like this idea, I like it very much. It’s like creating a new country, I don’t know yet what it’s going to look like, but just to give you an idea that it’s going to be a new country with a new constitution. Basically our government will criticise different things. It will have ambassadors of different countries, so basically I’m trying to contact people from Africa, from Asia, from other people to be representative of us and ambassadors of that constitution. Then we will come together and discuss a specific topic, and then we will design this stamp. First we will design a huge stamp, we’re working on the process with a designer as well to make a stamp to represent this government. This stamp would be a huge one, it would be in an exhibition, and we have small stamps which is used to seal documents. That stamp will be sent to different embassies, so each embassy will have their own things. I don’t know yet what they will do, but the first project we will call it, Cultural Minister or Cultural Secretary, depends on what term we are going to use, so that person will invite an artist to come and will issue a certificate to them. So you are now recognised as an artist because we as a government recognise you. We will send a certificate like this. Annie: So the performance uses the structure of government but tests these ideas. In what circumstances would you then feel that you would be able to make the performance? Reaksmey: I think after the constitution is finished, and after I have a group of people, then my first performance would be in Cambodia, so these people they act as ambassadors as well, but they would also act as the parliament. We would invite everybody to join the project, say we would have an issue about environment, if somebody comes up with an idea about environment, we’ll say okay, then we will create a ministry of environment. So the ministry of environment will be created, we will have one stamp to represent that ministry. And then the performance would start. We invite in many different people to come, say each people will have their own performance in their own country, it might happen simultaneously, I don’t know, but myself I would do a performance, not me as kingship, I am also an ambassador to the constitution because the constitution is higher up, so I would be an ambassador but acting also as an environment minister, more specifically in Cambodia. So we will do the performance according to that. Annie: Do you need it to be part of a festival, or do you need anything, such as funding? Reaksmey: Funding, maybe, I’m not quite sure about that. I hope there’s no cost to that, but of course you will have a cost to send the stamps to different places. To design the stamps or then afterwards, after everybody in the parliament said that we’re fine, we’re done, our performance is over, so then we will start to have this idea. We will design this big stamp, huge one out of rock or something, we don’t know, so we will put that stamp as an installation. Then to stand with the mirror, something like this, it depends what it’s going to be. Annie: Returning to the debates in 2011 and 2014, what do you think is the difference between performance and performing arts in Cambodia? Reaksmey: I don’t really like the ideas that people said, that performing art is different because performing art is happening in the theatre and on the stage. I think everywhere is a stage. It’s difficult to remove that part of the performance, you need the stage to do the performance, but the difference between performing and performance art is that performance art you sometimes don’t need a director. You don’t need somebody to direct you. You perform because you feel it is time, you feel it is the right space, you feel it is the right audience. So sometimes this could be an impromptu event. You don’t have to have advanced organisation beforehand to do a performance. So I think that is the most important part of performance, because it is in some way, very organic, and you keep playing with the environment you keep playing with the space, you keep playing with the audience as well. Sometimes it might go wrong, for example, Marina, she didn’t expect that some people will put the gun on her head. I mean she would expect that, but she wouldn’t expect anybody to be very strong with that, but this is very organic as part of the performance, part of what’s happening next, everybody will wait to see what happens. But in the theatre, in the performing art, if you are very good at looking at the show, when you watch 15 minutes, you might understand what’s going to happen, what’s going to be at the end. Something like this. Annie: This kind of performance – what does it do that is different for the audience? Reaksmey: I think it’s different because it offers a different environment, it offers a different experience where this is also stage-based performance, but you allow and invite the audience to come in with you. The difference is that the audience now interacts with you, and the interaction between audience and performer is different. It’s like a one-way dialogue, and performance art is a two-way dialogue, interaction, like the continuous interaction between the performer as the subject and the audience as also subject. It’s better because it is a performance, but at the same time you can treat it as a conversation. It produces a new platform where everybody would treat it as an art piece, but then will act on that art piece, to talk, to discuss. So I think it’s more effective because this platform provides different opportunities at the same time. I will refer to Marina’s work. In Cambodia we rarely see performance art. I think for live painting, I don’t consider it as performance art, because, I don’t know what, just the idea that performance art is also about conceptualisation, it’s about a combination of conceptual art and participatory art. And in live painting, we miss the idea of conceptual art. Live painting is more focusing on the painting itself, so like, paint it, make a picture, rather than producing an experience. Because performance art sometimes doesn’t resolve in an art piece, it’s resolved in an experience. Although my developing idea will resolve in a stamp as an installation, but again, with the stamp itself wont be the performance piece, the stamp itself will be the installation, the art piece by itself. Annie: Can we think of live painting as performance art is in its very early stages, because some of the guys do talk about concept, they do talk about idea, it’s just because the language, maybe the reference point of what concept might be, needs a lot of development. It is at this early stage of thinking, how can we harness this to show the concept, that is still not maybe so far developed in terms of its form. Although I think they talk about it trying to make it a little bit theatrical, in some ways. Reaksmey: There is performance art that I proudly call performance art in Cambodia – it was Anida Yoeu Ali’s piece, when she did the performance, at the White Cube, and the photo taking which she asked people to jump. When she did this frame, and then you go inside and you do whatever you wanted to, that for her, that’s probably not performance, but that’s for me also a performance, because she herself is the photo taker. But in this case she’s not asking us to pose according to her, she asked the audience to join in the piece and then do whatever they’re responding to, and then she take the photo. Annie: What else do you think can be done to further develop the performance art scene? Reaskmey: I think we should introduce more performance artists in Cambodia, bring more, and there probably should be a festival for performance art. In order to develop it, I think it’s a very new idea in Cambodia as well, and the language doesn’t really have very much. Probably there should be a dialogue about performance, although SA SA Bassac did a lot of talks already about performance art, but it doesn’t reach a larger audience, so maybe there should be more dialogue about what is performance art, and to see if everybody agrees. If not, then, I don’t know, it’s for them to answer that question. Annie: So turning back that question that you like to ask other people, what do you think is the importance of the work that you do, to where Cambodia is right now, in terms of visual art and in terms of society? Reaskmey: I think I like the idea of diversity. I think my work, or I’m talking specifically about work in the arts, rather than my performance piece, will contribute to create this diversity of Cambodia, this richness of Cambodia. We also have been developing a new cultural identity of Cambodia, although contemporary art, some people might argue it’s a Western culture, but it’s happening in Cambodia, it’s done by Cambodia artists. In other ways, it has been Khmer-ised. Of course it’s embedded into the culture. I believe my contribution, to make that culture of Cambodia and to redefine what is Cambodia today, and to build the cultural identity of Cambodia. This interview is part of a series that began with my curatorial research residency in Cambodia in 2016, which was kindly supported by Java Arts, the Artists International Development Fund and National Arts Council Singapore. The interviews and materials will be accessible at the Live Art Development Agency as part of the Southeast Asian Performance Collection launched by Something Human in November 2017.